It’s the most wonderful time of year yet again and it seems like everyone is in a generous mood this Christmas. The team over at Sky Casino have definitely decided to go all-out with their gift-giving this year, thanks to their many seasonal promotions. One of the best we’ve seen is Festive Free Spins. Sign up for the site or log into your account today and you will be able to claim either five or 30 free spins, depending on how much you choose to stake. If this sounds like an ideal way to celebrate Christmas and New Year, keep on reading to find out how to claim this offer for yourself. There are two rewards on offer in the Festive Free Spins promotion. Which one you get is totally up to you. Stake £10 for five free spins and £50 if you’d like to receive 30 free spins. 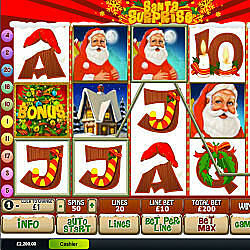 These spins are for the hugely popular seasonal slot, Santa Surprise- we’ll tell you more about this game a little further on. To get involved with Festive Free Spins, you must sign into your Sky Casino account any time between now and January 7th, and then ‘Opt In’ to the offer. Once you’ve opted in, you can choose to stake either £10 or £50, depending on how many free spins you’d like to enjoy in the Santa Surprise slot. This must be real money but it can be played in any Sky Casino game. The free spins should appear in your account immediately, leaving you free to head over to Santa Surprise and start spinning! As you would expect from the name of the game, everything about this Playtech-powered slot is thoroughly festive. The jaunty tune of Jingle Bells plays in the background throughout the game and the reels are filled with images of presents, mistletoe, stockings, trees, and, of course, Santa Claus himself. The five reels and 20 adjustable pay lines of the slot can be played for as little as 1p and as much as £1,000 per spin. That means that no matter what your betting style and budget are, you’ll be able to enjoy Santa Surprise at your own pace. As if the fantastic standard gameplay wasn’t enough to entice you into giving Santa Surprise a go, the slot is also packed full of extra bonus features. Snowy cottage symbols represent the scatter in this game. If you’re lucky enough to find three on the reels at once, you will be treated to a generous free spins round with a 3X multiplier to boot. Then there are wilds, sticky wilds and a very special pick-n-mix bonus game where you select from the surprise reward of your choice. All registered members of Sky Casino are welcome to take part in this offer, regardless of how long they have been signed up to the site and how much money they have previously staked. Please remember that in order to receive free spins, you must ‘Opt In’ before depositing your £10 or £50. Only money staked during the promotional period, December 4th to January 7th, will qualify you for free spins. The free spins must be claimed within seven days of entering the promotion. After this time they will expire. Please note that there is a 5X wagering requirement attached to any winnings you make from your free spins before funds can be withdrawn.